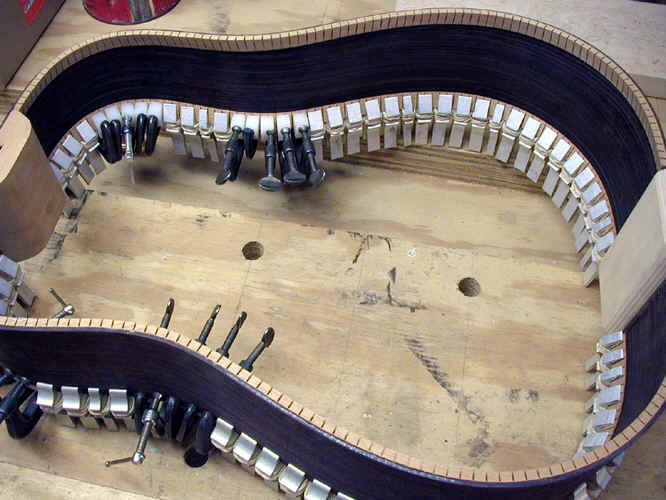 One of the many small but essential tasks in building the guitar body is making and installing the linings -- the triangular kerfed strips which are glued onto the ribs to provide gluing surface for attaching the top and back. 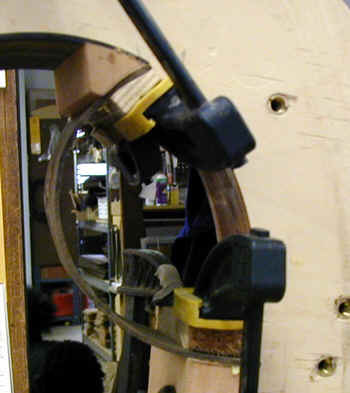 This is a part of the guitar which has little or no acoustic function -- they merely hold the guitar together. Here are some photos of how I do it. NOTE: These photos are thumbnails. Click on the photo to see the full size version. I then rip out strips of linings with the blade set at a 30 degree angle. 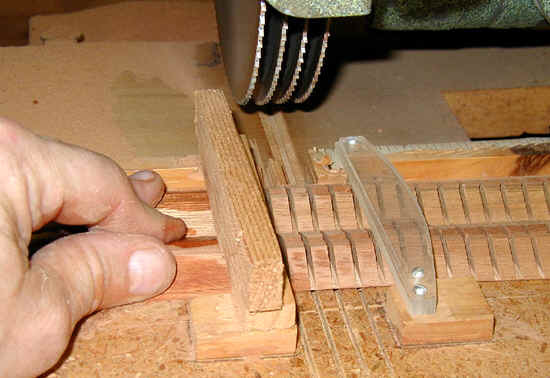 Since the blade must cut into the "fence" to separate the piece, I attach a wooden backer board to the fence of the saw. 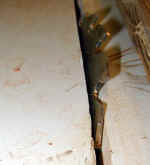 This is what the cut will yield. 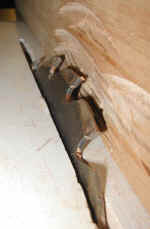 I do then run the piece thro the saw with the blade set at 90 degrees and trim off the feather edge of the lining strip. 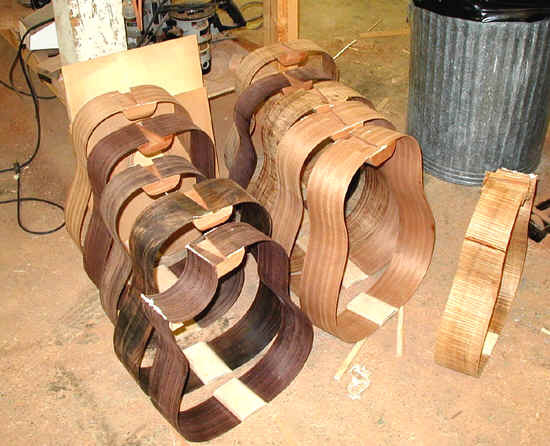 Here is a stack of strips which have not been kerfed. After the strips are made they must be kerfed. 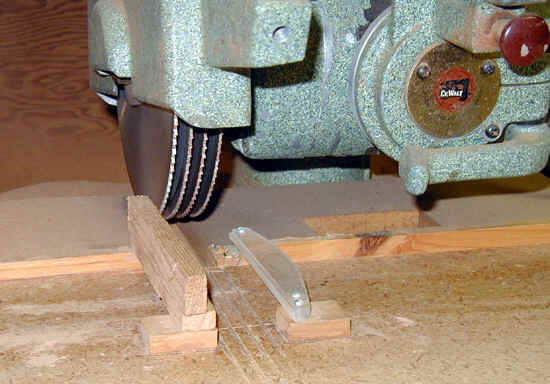 In order to speed up the process and make the kerfs more uniform I took an old radial arm saw and mounted 4 thin blades (I had the spacers made by a local machinist). (Look here for another photo of this tool). I cut the strips 4 at a time. 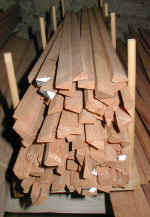 This is a tedious and boring job, so I try to do several hundred strips at a time, and do it at a time when I am alert. 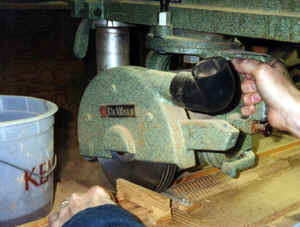 Another view of the process of cutting the kerfs. The small piece of wood between my hand and the blades is there to prevent any slips of my hands, which would have disastrous results. A pile of completed linings. 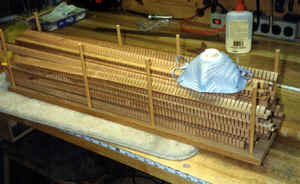 Before the linings are glued to the ribs, the ribs must be sanded. 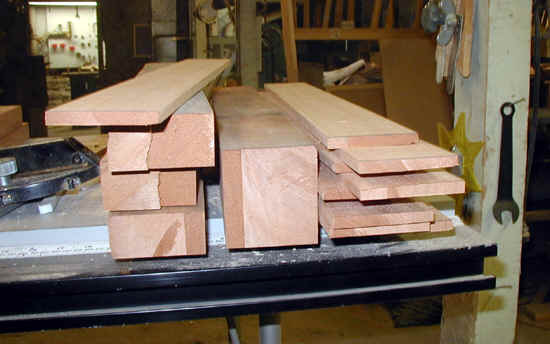 Although I sand the ribs smooth before bending, the water and heat discolor and roughen the wood. I used to do this by hand, but now do it with a flap sander mounted in a drill press. This could also be done before the end blocks are glued in place. 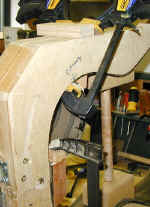 This photo shows the small caul (on the right) I use to facilitate clamping the linings. I have a box with several hundred of these, which I made at least 20 years ago. Simple but effective. A bunch of ribs (is bunch the correct word??) waiting in line for linings. The alternative to all of the above is to buy premade linings - which I have recently done. Saves time - more than enough to justify the cost, particularly given the very high quality. 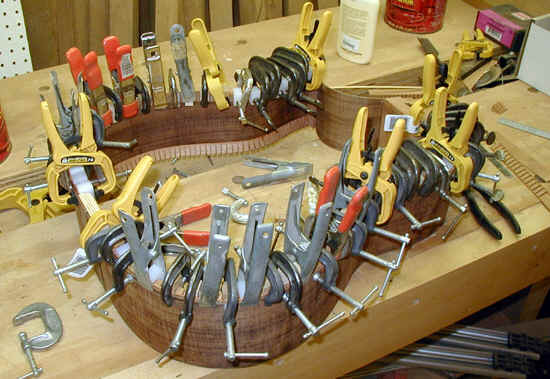 the linings I purchase work very well with some specialized clamps purchased from the Taylor guitar Company which are specifically designed for gluing in linings. 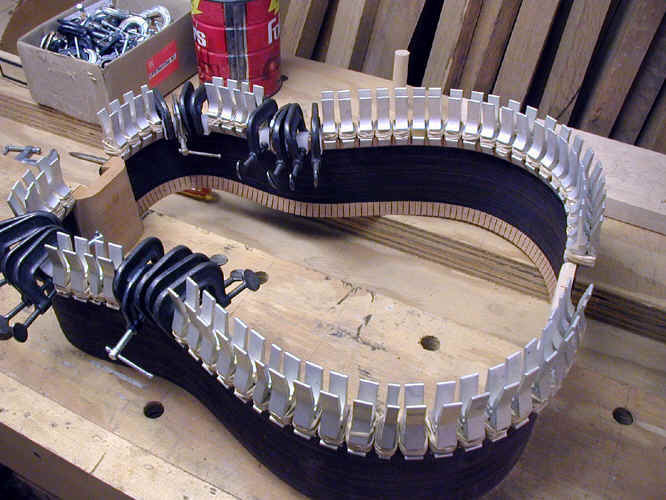 they use surgical rubber tubing or rubber bands for the spring force. Here the cutaway is being glued into place. 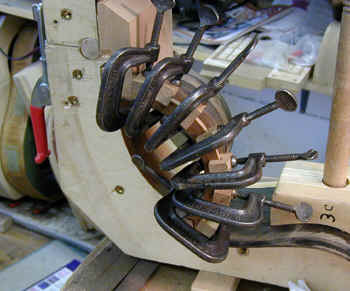 The blocks have been carefully shaped and carefully shaped cauls are used to clamp the cutaway in place. 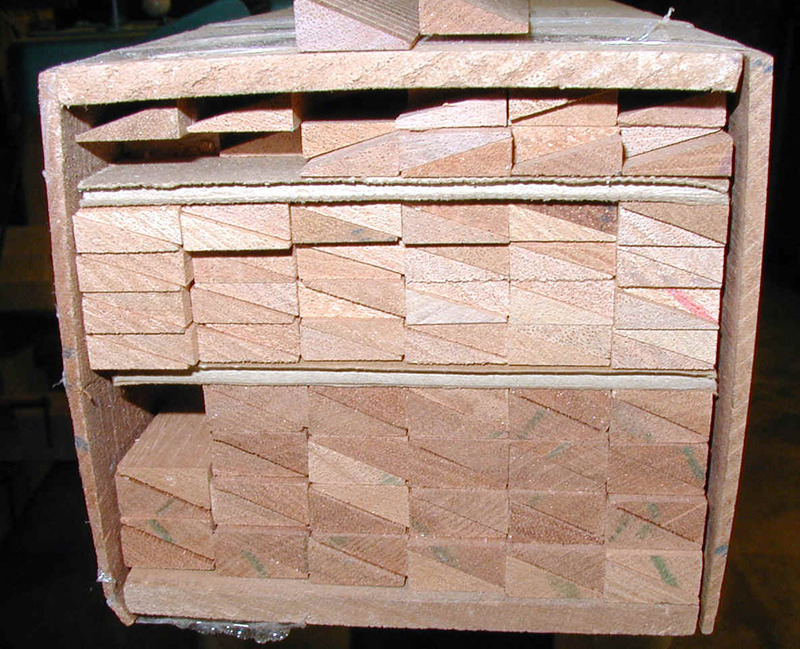 This seems relatively straightforward but is completely dependent on the blocks being carefully shaped. Another picture of the same. 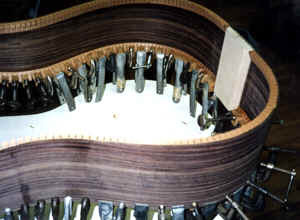 This shows the linings for a cutaway being glued and clamped. 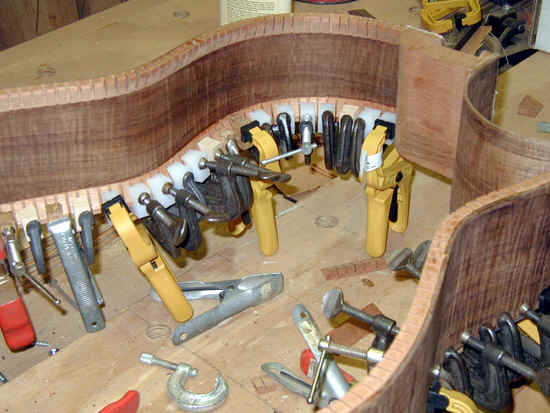 I use a solid rather than kerfed lining for my cutaway. 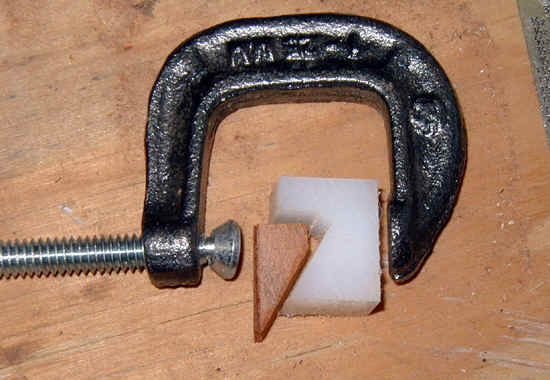 I have always seen this as a "weak" part of a guitar and try to ensure that it is strong and won't fail. Many fine makers use a kerfed lining here, and others do as I do. I am not sure that there is any real difference.